This is one of those interesting finds that doesn’t happen that often in the anime industry. A veritable gold mine of Artmic’s production drawings from Mospeada and Southern Cross have been unearthed (which were the last two thirds of Robotech basically). They were originally for use at the model kit company Imai. 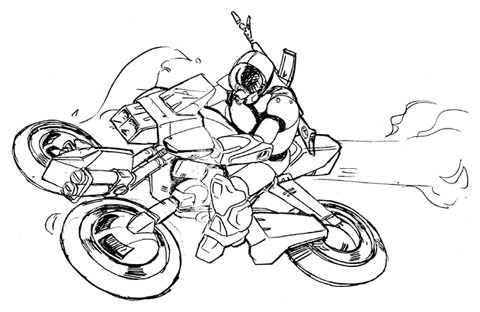 These drawings include a lot of fascinating sketches for early designs from the respective shows, much of which was penned by Shinji Aramaki (who recently directed “The Package” for Halo Legends). It’s also very timely considering that Capcom had also tried to include the mecha from Mospeada in the latest Tatsunoko vs Capcom. The discoverer of this treasure trove, Roger Harkavy, has very kindly archived his findings in a comprehensive PDF (you can get it here). I honestly loved Mospeda, so this is pretty cool stuff. Some of the mecha drawn there seem to better fit the description of the powered armors in the novel version of Starship Troopers than even the actual anime of the novel was able to accomplish. Some of the bulkier MOSPEADA ideas are really something. This is great! I remember when Roger Harkavy first discovered these designs and spoke about them…truly amazing work.